Sound blankets are used to absorb sound and reduce noise by creating a sound barrier. Also known as sound barrier curtains, these sound barrier blankets can be suspended from portable frames, floor mounted frames, or attached to your ceiling to serve as a dividing wall between machine noise and employees. Unlike sound panel treatments, which are designed to attack the “path” of reflecting sound waves inside a room, these sound blanket systems are designed to attack the “source” of the original sound and literally “block” the noise from releasing into the room. Sound blankets and sound barrier curtains block noise like sandbags blocking flooding water. Clients should consult with our help desk to devise customized applications for their sound blanket treatments to wrap around machinery, suspend from framing built around machinery, suspend as dividing walls between machinery and people, or suspend against a common wall to combat sound bleed through the wall. 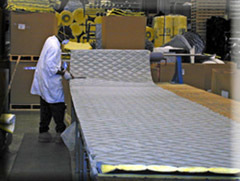 We offer sound barrier dugouts, sound jackets, portable soundproof screens, vinyl strip curtains, as well as, an entire line of vinyl quilted and non-quilted sound blankets for interior and exterior applications (see QB Sound Absorbing Blankets, outdoor QBO Blankets, Sound Barrier QBS Blankets, and Sound Barrier QBV Curtains). These sound blankets and sound barrier curtains are all customized to the needs of your noise mitigation project, including cutouts, holes, slits, patches, windows, removable lids, and so on. More times than not, these sound blankets are partial coverages, and will be complimented with a set of acoustic panels or sound baffles to help capture and convert escaping sound waves in your sound blanket application. 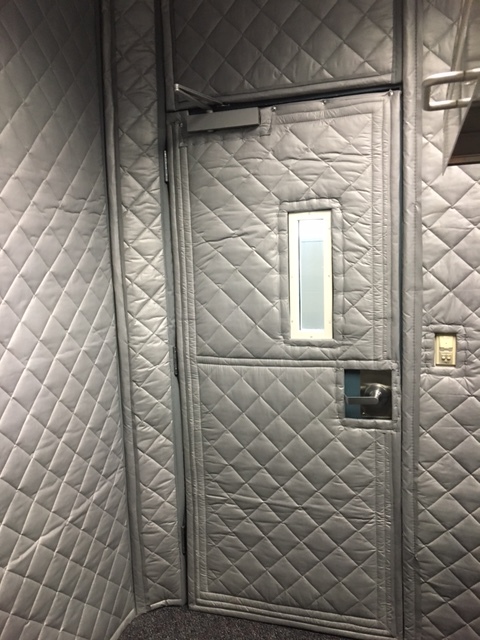 These noise reduction curtain systems are grommeted across the top for easy vertical suspension, with velcro edges to interconnect sections, and are fully upholstered and receive a diamond stitch pattern in their facing. There are sound blanket systems designed for both interior or exterior use. For help in product selection, be sure to call our help desk at 1-800-638-9355. Our standard sound blanket. Class A fire rated. For indoor use. These QBS Blankets can be custom sized to match the cavity size of any project. We can cut holes, slits, patches, windows, hatches, vents and anything else to accommodate your custom fit soundproofing needs. Use to suspend from the ceiling, a floor mounted frame, against a common wall, or direct to your machinery casing to block up to 80% of the transmitting noise. These sound barrier blankets offer an effective drop in decibel levels, blocking original noise, and rendering the perimeter space far more user friendly, functional and safe. These are 4′ x 8′ kits of QBS Blankets that are shipped with a tubular framing system that allows you to free stand the sound blankets as you wish to block directional sound. 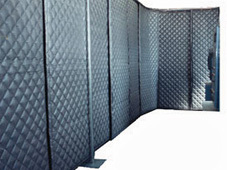 SoundScreens serve as modular noise barrier wall partitions, but can cut only to a height of 8′. If you need taller treatments than this, use the ceiling of your facility, and drape QBS Blankets down from the top. If you have questions related to the use of a Soundscreen sound barrier curtain system, call our help desk at 1-800-638-9355. Sound blankets designed for use outdoors. Ideal for absorbing and reducing noise that stems from construction sites. Also popular for anchoring to framing built around outdoor stationary noise sources such as generators, air conditioners, and pool pumps. QBO Blankets are designed to hold up against inclement weather conditions, and trigger the same drop in noise levels as the indoor QBS Blankets. Sound blanket projects are custom quoted based on the scope of your upcoming noise reduction project. You can either use this form to submit your dimensions, or call to our help desk at 1-800-638-9355.